Each Sunday a fellow coach challenges those of us who follow her with a challenge. This week it was to use an item from our Bloom Benefits or Host Exclusives. Since I had just gotten these cool dies I wanted to use them. The cool reindeer, wreath, and pad are the die set Dashing Deer and the vine is our new Mystic Vine die. You can get either if you purchase over $150 or have a party totaling that. 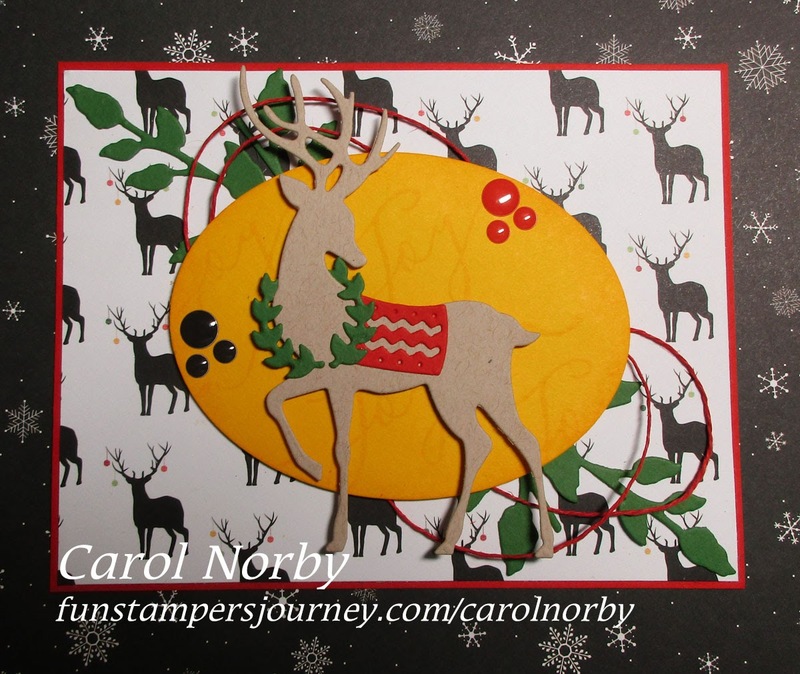 I started with a base of Candy Apple card stock and layered the piece of Christmas Cheer Prints over it. Next I used the Vine die on Kiwi Slice card stock and adhered the two as shown. I added some Candy Apple Twine into large loops to make sure it was visible under the focal piece. Next I used our Oval dies to cut the Summer Days card stock. I stamped the Joy from our Holiday Script stamp set (this set also comes as a Bundle with coordinating dies) diagonally across the oval using Summer Days ink for a subtle look and sponged (I cut mine into quarters) that ink around the edge for a bit more pop. I used our Foam Squares to adhere the oval over the Twine. 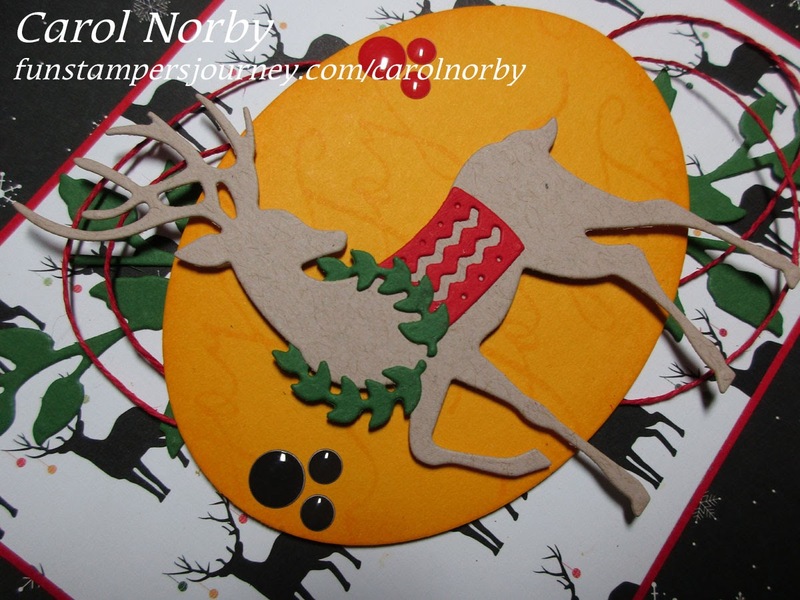 Now for the reindeer. I used Oatmeal Cookie, Kiwi Slice, and Candy Apple card stocks then adhered the blanket and wreath into place. It also was adhered with Foam Squares. I added the elements from our Magical Candy Drops to finish the card. Other products used were the Amaze machine and the Easy Glide Runner. I'm thinking of using this design for a class in November but will use Silver Sequins or the Holiday Elements instead of the dots. I did find out my upline saved a picture of the card to her favorites file to make later. I'm very flattered. How are you doing on Christmas cards? Will you have enough made for your mailing list? And stop by tomorrow as I'm taking part in a Blog Hop of FSJ coaches celebrating the Holidays! I have 2 projects to share.